Namaste, is the (only?) best Indian Cuisine all you can eat buffet in Vancouver, Washington. That is all. 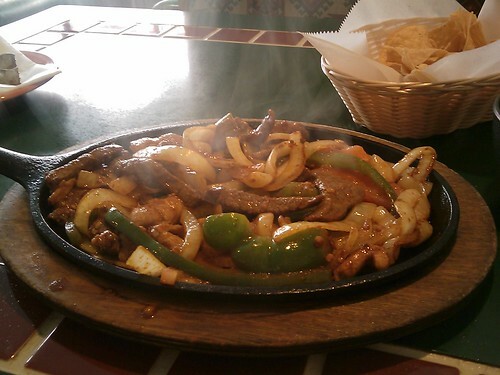 $10.29 + ($0.85 tax) + (30% * $3 = $0.90 for coupon) – $10 = $2.04 + tip for some $11.14 fajitas. I plan to do this once a month — as often as the coupon allows. I sold my previous laptop, a Dell Inspiron 700m 12″ notebook, and shortly after I purchased a Dell Vostro 1500 15″ notebook. I’ve had it for a month and a half now, long enough to make a balanced review. Final price: $968.00, with free next day delivery. Shortly after I ordered, Dell was giving away free webcams on the LCD, but my order was too late. Subsequently, they gave me a $50 voucher for the difference. That effectively made the final price $918.00. As soon as I found a deal, I bought a 2x1GB Memory upgrade, “Patriot 2GB (2x1GB) PC2-5300 DDR2 667MHz CL5 200-Pin SO-DIMM”. Aftermarket RAM is always going to be cheaper than ordering it preconfigured with the notebook. I installed the memory via a guide I found, it was easy, took about 20 minutes from powering the laptop down with 1GB to powering it up with 2GB of RAM. Final price including the RAM upgrade: $972.00. It’s hard to go from a 12″ to a 15″ notebook, but not nearly as hard as it was to go from a 15″ to a 12″ notebook. The hardest things for me to get used to were the new key sizes and the new key placements on the keyboard. The graphics on my 12″ were very sub-par, so comparatively this laptop performs exceedingly well. Admittedly not the most impressive game repertoire, but that will change in time. I was able to adjust the settings to max for every option on Counter-strike: Source. I could notice a slight lag, but I was still getting 40fps easily. A few times inside of a game, I’ve had my graphics driver fail, which either causes the system to lockup, or revert graphics to 800x600x16 and not allow correction until reboot. This happens so rarely I won’t really know that it’s fixed. I’ve had the same issue on other systems, other graphics cards, other drivers. I’m certain that there will be an updated graphics driver that will fix it and not mention anything about it in the changelog, so it’s almost not even worth mentioning. No, I didn’t just eat some greasy potato chips and plant my fingers all over this before taking the picture. It’s overly sensitive and shows its markings. This might be a turn-off to some people, not to me. The latch that holds the lid closed is very cheap and flimsy feeling, and doesn’t come to a snug close. I’ve heard stories of people breaking this off already, and I’m sure (ironically) that it’s not a cheap replacement. Once the lid is closed, there’s a fraction of a millimeter between the screen and the keyboard, just enough so that pressure upon the back of the screen will make it feel like it’s moving toward and away from the keyboard. That’s a little nerveracking, and I feel it detracts quite heavily from the quality of the notebook. It feels like the hinge that connects the screen to the base is too tight, it’s impossible for me to open the screen from closed position with one hand. This is just a minor annoyance, but it’s constant. Every time I have to put down something in hand #2 to help hand #1 open the screen, I get just a little bit more annoyed at the notebook. There are some obvious draws to the default specs of the Vostro. It is pretty thick and heavy, and the battery life is less than optimal compared to some other notebooks in its class. I don’t mind it, in fact I prefer it. I’ve had a portable laptop in the past, and frankly I find more use to a decently priced desktop replacement. I guess what I’m trying to say, is if I could get away from paying extra for a lighter, longer-charged, thinner notebook, I would…, and I did. That being said, I was still able to get almost 2 hours of battery life with casual use — more than I’d need. One of the selling points of the laptop is that it doesn’t come prebundled with Dell’s bloatware. The bloatware never really affected me too much. I ordered the Vostro with Windows XP Home, because I have my student license of Windows XP Pro with which I planned to wipe the hard drive as soon as I received the laptop. I did just that, and found the drivers from Dell’s Vostro 1500 driver page without any problems; every device worked. At some point in the past month and a half, Dell decided to no longer host the Windows XP drivers for the Vostro 1500, now you can only select “Windows Vista 32-bit” as your Operating System. Now this is not to say the drivers they have listed won’t work with Windows XP, it just means that they’re working toward no longer supporting XP on the 1500. This is very discouraging, considering I don’t have a student license of Windows Vista :). As of Oct-12th, Windows XP is available again. It must have just been a temporary outage. Two or three times since I’ve received the laptop, I would get weird BIOS messages, saying something to the effect that “the battery is not found or not supported.” I wish I would have captured this image to find out more about what it means, but since pressing F3 to ignore has been working, I’ve been content with that thus far. Next time I get it, I’ll be sure to capture it and followup with that error message. This is only the second laptop I’ve owned or used very heavily, the first being my Dell Inspiron 700m. I’m very impressed with the power of the unit, Dell has made it very customizable and upgradable. There are quite a few shortcomings, this is really Dell’s first shot at a Magnesium-alloy chassis. However, I applaud their efforts, and I couldn’t be happier with the result. In 2005, I reviewed the Antec Notebook Cooler. It broke in early 2007 as a result of connecting a VGA cable to my Dell Inspiron 700m, when there pretty obviously really wasn’t room for it to fit. Eventually the thin wire that connects the USB cable to the USB plug was separated, making the device useless. It looks like a definite weak spot of the device. A year’s use for ~$10 is nothing to complain about, though. So after some time using an inferior cheap replacement, I decided I needed to set out and find another Antec Notebook Cooler. Man you never know what you’re missing until it’s gone. So I bought another one used for ~$10. So if I had to revisit the 9.5/10 score, I’d now give it a 9.0/10, due to its critical weakpoint. Now that I know what can go wrong, I can prevent it from happening again.